The professional's software solution for remotely controlling your Nikon D810, Nikon D800, Nikon D800E, Nikon D750, Nikon D610, Nikon D600, Nikon D4s, Nikon D4, Nikon D7200, Nikon D7100, Nikon D7000, Nikon D90, Nikon D5500, Nikon D5300, Nikon D5200, Nikon D5100, Nikon D5000, Nikon D300, Nikon D300s, Nikon D700, Nikon D3X, Nikon D3s or Nikon D3 digital SLR from a Windows PC using a USB cable. NKRemote includes a complete software solution for a professional photobooth. Please see our photobooth page to find out more. Please Note NKRemote was withdrawn from sale on January 1st, 2018. Please see the news page for more information. Automatically create animated GIFs which show a slideshow of the photos just taken with optional title pages and overlays. MP4 copies of animated GIFs can be created and the animated GIFs (or MP4 copies) can be shared via email, text, Facebook or Twitter. Alternatively photos, animated GIFs and MP4 files can be viewed in Breeze Kiosk where they can be shared via email or text or posted on Facebook or Twitter. What Do I Need to use NKRemote? 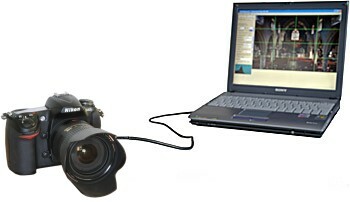 A PC running Windows 10, Windows 8.1, Windows 8, Windows 7, or Windows Vista, a USB cable to connect the camera to the PC and a Nikon D810, Nikon D800, Nikon D800E, Nikon D750, Nikon D610, Nikon D600, Nikon D4s, Nikon D4, Nikon D7200, Nikon D7100, Nikon D7000, Nikon D90, Nikon D5500, Nikon D5300, Nikon D5200, Nikon D5100, Nikon D5000, Nikon D300, Nikon D300s, Nikon D700, Nikon D3s, Nikon D3 or Nikon D3X camera. Who Uses Our Camera Control Software? Portrait and event photographers take pictures using the camera as normal and download them automatically to a PC where an assistant can show them to customers, take reprint orders or print them on the spot. Comments can be added before or after taking a shot to help identify the subject later. The comment is stored in the photo and can be used for the image filename making it easier to identify shots. Product photographers use the grid overlay option for accurate alignment and composition of product shots. The ability to control shutter speed, aperture, ISO etc. from the PC and to take fast, large preview shots saves valuable time when setting up a shot. The flashing highlight display and histogram display (intensity, red, green and blue channels) give accurate exposure feedback. Provides color managed previews for more accurate display of colors for critical applications. Mast and Aerial Photography: Our camera control software allows real estate agents and others to control a camera mounted on a mast or cherry picker from a PC at ground level. Full frame remote live view display on the PC is available with NKRemote when controlling a Nikon D810, Nikon D800, Nikon D800E, Nikon D750, Nikon D610, Nikon D600, Nikon D4s, Nikon D4, Nikon D7100, Nikon D7000, Nikon D300, Nikon D300s, Nikon D5300, Nikon D5200, Nikon D5100, Nikon D5000, Nikon D90, Nikon D700, Nikon D3X, Nikon D3s or Nikon D3 digital SLR. How Much Does NKRemote Cost? NKRemote costs US $275 (click here for free trial* or to purchase). The price includes one full year of free upgrades. Breeze Systems also provides customized remote capture applications for Canon and Nikon DSLR cameras and Canon PowerShot cameras. Contact sales@breezesys.com to discuss your requirements. *Risk Free. Try before you buy. When you do decide to buy there is no need to download the software again - simply place your order and then enter your registration code to unlock the software. *The ability to upload to and download from third party applications such as Facebook, Twitter, Instagram is subject to each third party concerned continuing to allow such interactions. These features are tested before they are released but may cease to function or be removed without notice if the third party concerned no longer allows such interaction or changes the method/protocol required.